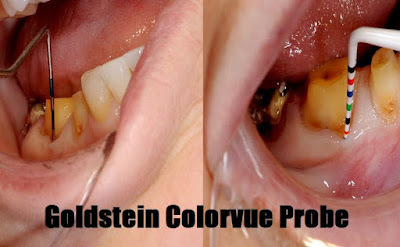 The Colorvue Goldstein probe was designed in 1/2 mm increments and extends up to 3 mm for increased accuracy especially in measuring sulcular depth for margin placement. The use of bright colors to differentiate these measurements makes the probing process much more efficient and accurate in relation to it's diagnostic use. While used in a restorative application, when probing potential infrabony areas or for other defects, a standard metal probe can cause the patient noticeable discomfort. The Colorvue Goldstein probe features a narrow, flexible tip which alleviates this feeling of irritation allowing for a more positive patient experience.